Do you purchase electronic parts for markets other than aerospace? AS5553 is your solution. AS5553 addresses fake component issues for all areas of the electronics industry. Computer, medical, cellular, security: any high-risk industry that cannot accept counterfeit parts should use AS5553. The requirements of the standard can be applied to any organization to procures electronic parts. Stop counterfeit parts from entering the supply chain, your inventory and designs with AS5553. This standard is your best defense against conterfeit electronic parts. Developed by SAE, this standard is intended to be used by any military or aerospace organization and establishes uniform requirements, processes and controls to manage the risk of receiving and installing counterfeit electronic parts. The AS5553 standard helps purchasers of electronic parts to establish and implement a control plan to reduce the risk of counterfeit parts from being installed or entering your inventory. According to John Keller (2007), the editor in chief of Military and Aerospace Electronics, "one of the worst trends to emerge in military systems design involves counterfeit electronic parts - those that appear genuine, but which actually are substandard	, altogether different, or in the worst case, simply empty packages. "(Source) Notice he classifies the problem as a "trend". Counterfeit parts are becoming common and frequent enought that they are no longer considered one-off problems or singular, unfortunate occurences. Receiving or installing counterfeit parts is a risk every organization faces with potentially fatal consequences. So the question is what safeguards do you or your organization have in place to mitigate those risks? How would you know, or worse, when would you discover your products had been compromised with counterfeit parts? Are your current systems even capable of detecting such intrusions? 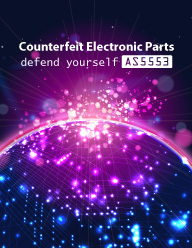 AS5553 was designed to be your best defense against counterfeit electronic parts. Don't be caught unaware. Contact us to discuss how AS5553 can benefit your organization. Guard yourself against counterfeit electronic parts. Contact us today! The primary complaint of most organizations is lack of senior management support. This one to two hour management overview is designed to present to senior management the benefits of an improvement based AS9100 management system. In fact, many of our companies do not call it a quality management system but rather a business management system. Once top management sees that this management system is actually geared toward improving competitive advantage, top management support is never an issue. A critical part of an improvement based system and required by AS9100, AS9110, and AS9120 is the identification of top management objectives. Many organizations struggle with driving the objectives down to the process level so that all the players understand what they must do to achieve the goal. This tool (Strategic Business Breakout) is designed to provide management with the methodology to manage this ongoing project. The heart of the aerospace management systems, AS9100, AS9110, AS9120, is the process management approach. Previous versions of ISO 9000 were focused on a silo-approach which had major weaknesses. The identification of processes, their sequence and interaction, along with defining how a process is know to be effective is a key step in developing an aerospace compliant system. Eagle Force Consulting has developed an easy to use and encompassing tool to facilitate this effort. This is one of the many aerospace additional requirements that must be addressed to prior to approaching certification. Eagle Force’s consultants have a proven method to assist client organizations in developing a configuration management process that meets the needs of that organization and the standard without creating a paperwork nightmare. This program includes establishing an approved baseline, documentation and change control, and configuration audits. A strong, solid internal audit program is essential to the development and continual growth of improvement based aerospace management systems such as AS9100, AS9110, and AS9120. Eagle Force Consulting has developed the premier internal auditor training course available. Most of the lessons are taught in a Socratic-style using actual case studies. Internal audits must evolve with the management system, with emphasis changing from documentation to implementation to effectiveness. Auditors in this course learn how to perform process-based internal audits in each of these phases. The Management Representative is not only the key person in maintaining an improvement based aerospace management system such as AS9100, AS9110, or AS9120, but also has the greatest opportunity within the organization to make a positive impact in the competitive advantage. One of Eagle Force’s primary objectives is to see that this person is a success. The Management Representative must effectively manage internal audits, corrective & preventive actions, document control, continual improvement, supplier development, and many other things such as interacting with senior management and every other level within the organization and frequently external parties as well. Eagle Force Consulting has developed a highly effective Corrective and Preventive Action methodology. Effectiveness here is dependent upon identifying and addressing the actual root-cause. The best solution may not be eliminating the root-cause, but in interrupting the sequence. This Eagle Force's consulting methodology was developed by our president and patterned after the NSTB’s highly effective program.